We love to play darts. The thing about darts is that it is an easy game for anyone to start playing. Even those who have never played before can pick up some darts and hit the board with them. They may not hit that treble twenty (intentionally) for a long time, but they will hit the board. Once you master the game, there is nothing better than that first treble twenty or high checkout. We have done the research and found the best dartboard cabinets out there. These boards not only limit the need for a dart backboard, but they look good too. Let’s start with our number one choice, which you'll find just below our top three picks. We like this tournament-quality cabinet and board. The darts could use an upgrade, but you are going to get everything which you want from a cabinet kit with this one. Setup is easy, and you are ready to play instantly. We love that you can customize this cabinet with the logo of your favorite team. If you love the NFL and you love darts, then this is a marriage made in heaven. This is a great starter kit for amateurs and children. The board is not as high-quality as the others on our list, but you will get enough play out of it to be worth the price you pay. The best thing about this cabinet is that it comes with everything you need to get a game of darts started. 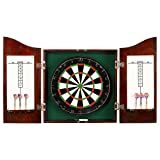 While most cabinets will only include the cabinet, this cabinet kit comes with a dartboard, two sets of darts, the cabinet itself, and a throw line. Once you have the cabinet hung at the correct height, you can place the throw line the right distance from the board, and you are ready to play. This dart cabinet looks great. The solid pine gives an amazing aesthetic which will fit with any room. The grain of the wood gives you a professional look which other dartboard cabinets do not. 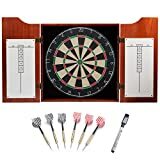 When you open it, not only do you get a professional dartboard with two sets of darts includ-ed but you also get a scoring area which is high-quality. There is also an out chart which will tell you which individual dart scores you need to make the most common outs. This is handy for beginners until they learn the common combinations. 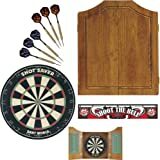 This is a great dartboard cabinet for everyone and deserves the top spot on our list — the qualities are apparent in every part of this kit. If you are an NFL fan, then this is the dartboard cabinet for you. You can choose to customize the cabinet with your favorite NFL team logo. The logo will be displayed on the outside of the cabinet, the insides of the doors, and the flights of the darts. Prove you are a super-fan with merchandise that your friends will on yet have. We like that the cabinet has been crafted from pine. The pine is not only sturdy and durable, but it also looks great with a unique wood grain which makes every cabinet one of a kind. On the inside, you will find a generous scoring area with enough room for four players to play simultaneously. You will also get a professional-grade dartboard and logo embellished darts. A great dartboard and cabinet to show your support for your NFL team. If you are looking for something a little different, then you have found it. The deep stain of the wood gives you something which other cabinets do not while still giving you a professional dartboard. This is a unique-looking dartboard which will become a focal point in any room. The solid wood is stained to give a darker look which brings out the grain of the wood. The dartboard is extremely easy to install and comes with all the hardware that you need to get this cabinet up and on the wall in minutes. Darts are included, along with a marker to keep score. The dartboard is regulation size and professional quality. The cabinet set has been inspired by the dartboards you see in old pubs. It has a lot of character. 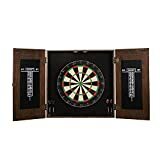 It may look old, but it has been constructed with a modern design which will ensure it holds up over time — an excellent dartboard for organizing tournaments with your friends and family. We like the look of this cabinet. From the dark-cherry stain on the outside to the green velour backdrop on the inside, this is a great looking board. We love the look of this dartboard cabinet. The dark-cherry stain gives a vintage look without it looking old. The stainless steel hinges are particularly welcome. They ensure that the cabinet opens and closes smoothly without the doors slamming on the cabinet. On the inside of each door, you will find a scoring area with enough room for four scores to be tracked simultaneously. You also have two sets of steel-tipped darts to get you started straight away. This cabinet has a classic feel which will allow you to have some classic games of darts. The board is long-lasting, and the surround has been crafted with enough quality to outlast the board. We like the darts and the board. The darts are high-quality, and the board is composed of sisal fibers. The bull is staple-free, and the darts feature grips which give you better throwing stability. This cabinet comes with everything you need to get a game of darts started. The cabinet is easy to install and features bronze hinges which not only look great but work well too. The board is composed of sisal fibers which will close up when darts are removed to close any holes created. We like that you have a choice of four finishes, making it a better choice if you are trying to match your color scheme. The included darts are of a higher quality than you get with most dartboard cabinets. You will need to buy a second pair, potentially, but you will not need to worry about upgrading this pair. We like the look of this cabinet. You have a choice of two finishes, and both will fit into any room of your house. This solid wood cabinet comes in a choice of two finishes. Both finishes look great and will ele-vate the look of any room. The solid wood is New Zealand pine. With this quality of wood, you know that the cabinet is going to last for a long time. The bronze hinges add to this longevity and being self-closing hinges; they are going to protect the wood and limit any slamming noises when you beat all of your friends at darts. We like the generous scoring area which you get with this board. You have enough room for four players to play simultaneously. You also have six darts included so that you can get a two-player or four-player game started without having to buy any extra accessories. This dartboard comes in a matte black finish which will fit into any room. The cabinet is also skinny, even when closed, and will be unobtrusive wherever you choose to install it. We like the chalkboard scoreboards on the inside, chalk being our preference to dry erase. The board is also reversible for use with baseball darts if you have them or want to buy them, opening you up to more options when playing. The cabinet comes with everything you need to start playing. You get the cabinet, dartboard, two sets of darts, and all the hardware to mount the cabinet on your wall. Can I use these cabinet for my electronic dartboard? The short answer is no, you cannot. Electronic dartboards take up more space and will not fit these cabinets.